This feature once separated the “bad boys” from those who liked to play it safe. At one point or another, we’ve all been told to “safely remove” our USB flash drives before yanking them out of the sockets. The results could be catastrophic. 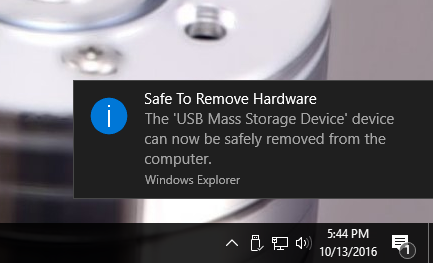 Thanks to a recent update in Windows 10, Microsoft has confirmed that it’s no longer a necessity to click “Safely Remove Hardware” prior to removing your USB devices (just don’t pull them out during file transfer or while an item is saving). Since its invention in 1999, you’d run the risk of corrupting the media/losing the homework on your flash drives if you removed a drive without safely removing first (sometimes, you’d be able to recover your files upon the next USB insertion). A recent update included the feature Quick Removal — which allows you to remove your flash drive at any point (when not writing files to the drive) without fear of losing/corrupting data.